And I’m off to the beach! Got a stack of books and my vintage swimsuit all packed. I’ll be back at the end of next week; in the meantime, enjoy this gorgeous beach scene from the Kodachrome Culture exhibit at the National Geographic Museum here in DC. 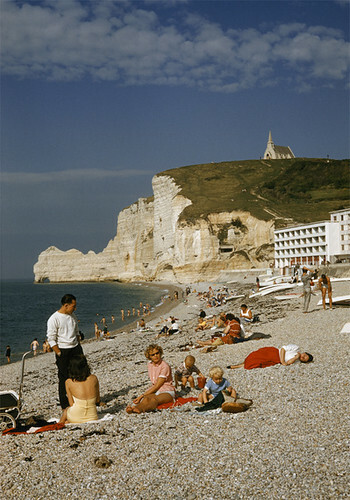 This one, taken in the 1950s at a beach in Etretat, France, has me psyched for the trip (check out the brunette with the red skirt and white top – so chic!). There are more wonderfully retro images here, all taken with incredibly gorgeous/saturated Kodachrome film, which was sadly discontinued recently by Kodak. No, not the weird ad campaign from McDonald’s – my new obsession is The Uniform Project, the creator of which has pledged to wear the same LBD every day for an entire year (today’s is above – so cute!). Each day, she transforms the simple garment into something completely new through styling. It is inspiring on so many levels: it reminds us how little we need and invites us to remember that loving clothes and fashion is sometimes a little like playing dress-up. Plus, the goal is to raise money for The Akanksha Foundation. I can’t go to ANY of these, but that doesn’t mean you can’t. 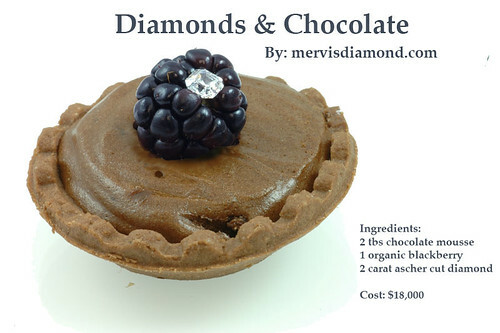 First up, in a hilarious feat of Photoshop, the Mervis Importers “Diamonds and Chocolate” party from 4:30-7:30 (they seem to have forgotten to list that sorta important info on the event page). I’ll take two of those little chocolate thingies, thankyouverymuch. RSVP online via the link. Over in Georgetown, Stacy London makes a cameo at Urban Chic, probably wearing some sort of pretty sheath dress, accessorized by her long, glossy hair, expertly toned arms and overall quippy awesomeness. DAMMIT WHY CAN’T I GO?!! The unfairness of it all! I love Stacy London and What Not to Wear. Can someone ask her to please bring the show to Washington, just once?! 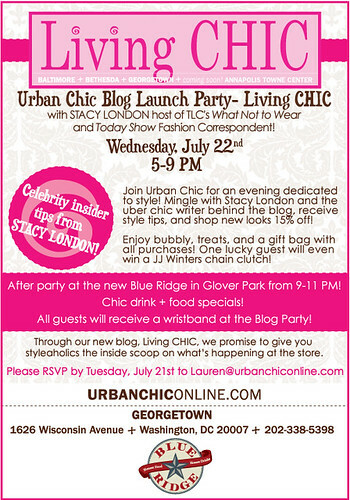 RSVP to Lauren@urbanchiconline.com. In Bethesda, Ginger hosts local writer Cathy Alter and her now-in-paperback book Up for Renewal, which, by the way, is the perfect beach read (wickedly funny, inspiring). RSVP to rsvp@thepattongroupinc.com. I leave for the Outer Banks this Saturday, and plan to replace my laptop with a stack of great books. In the pile (aside from Cathy’s book), thanks to recommendations from friends: The Devil in the White City, Middlesex, and The History of Love. And definitely Concord, Virginia – a set of short stories written by Peter Neofotis, an old friend from Lexingt..I mean, “Concord.” He gained momentum in New York telling these as one-acts (New Yorkers love the South) and I just heard that he’s here for the Fringe Festival! Last week I made a rare trek across the Key Bridge (I still get a rush of I-live-here!-excitement when I drive across) to Clarendon for an informal shopping party at Farinelli’s. It was hosted by Em Hall, former blogger for DC Goodwill Fashionista and who now works for the USO. She’s also doing the women’s buying for the store, allowing the owner, Mauro, to focus on what he does and knows best: denim and menswear, their core (at the moment) business. Even though I told myself I would not be buying anything, I came away with the most gorgeous silk Vena Cava dress, for $100. Which is considerably less than you might find for it elsewhere online (take that, online shopping!). I actually wore it out of the store, not because I have zero patience, but because I stumbled in the dressing room and busted the zipper of the Trina Turk high-waisted skirt I wore in. A delicate flower I am not! So, ladies, take note – they seem willing to negotiate on their spring and summer stock to make room for fall shipments (things move quicker than a fifth-grade romance in retail). I’m certainly looking forward to their womenswear stock in the coming seasons. Now I just need to find shoes….